It goes without saying that working with robots and heavy machinery is more than a little dangerous. While better practices and ethical companies are still less common than they should be (as this excellent Bloomberg Businessweek piece describes), smarter robots are another, parallel solution. 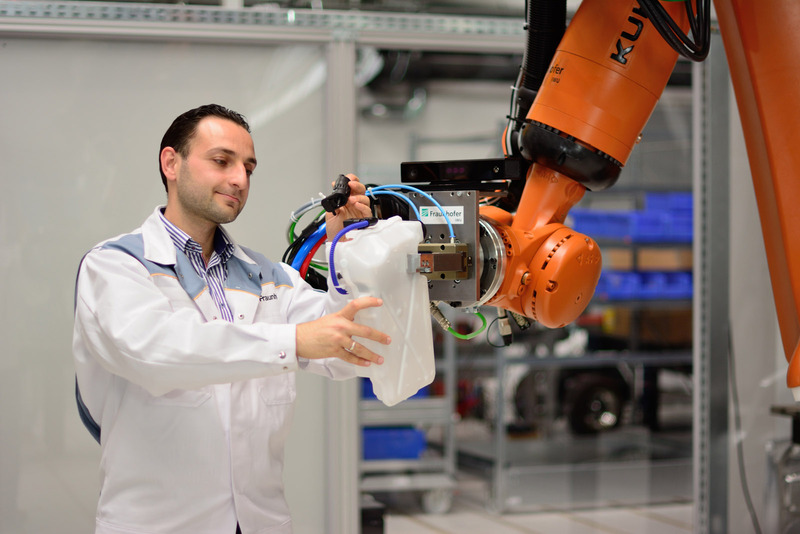 German research outfit Fraunhofer suggests an intuitive model for human-robot collaboration in industrial settings. In many places where there are robots operating, there are basically two zones: a safe zone and an unsafe zone. Robots can move quickly and with great force, so basically anywhere within their reach is unsafe, and a designated area away from it is officially safe. Many robots won’t operate at all if someone enters the safe zone. But when humans and robots need to interact frequently — to inspect parts, to hand things off or just to get by — it makes sense for there to be a third zone, for friendship and jolly cooperation. The Kooperation Zonen, as the creators call it. Fraunhofer’s model uses cameras to track the position of people in the robot’s general area. If they’re in the green, the robot can go at full speed, doing what robots do best. But if someone comes closer, the robot doesn’t halt, it just enters a new behavioral profile. It can keep doing its work, but it will do so more slowly, or could execute human-specific motions such as lowering its arm to the required position on the side where the person is. But if the person steps closer, into the red, the robot stops moving altogether. That close it’s not safe for it to be moving at all, and anyway the human is probably getting close in order to shut it down or mess with its innards. Robots are definitely taking over in many parts of industry, but operating and maintaining them is still a very human job. Anything like this that promotes healthy human-robot interactions sounds like a good idea to me.